What is hope and faith? We had just seen recent blockbuster Cinderella. Therefore, with fairy tales fresh on the mind, I explained hope and faith in the best way I thought an eight year old could understand. Hope is to believe in a happy ending. Biblical "hope" is having a confident expectation of a positive outcome. Therefore, to have faith is to believe or have a confident expectation of a positive outcome when the evidence is not yet seen. In the movie Cinderella, there is a point when Cinderella nearly loses her hope. She almost can't believe in her happy ending. But, we all know what happens, don't we? Yes. Her fairy God-mother shows up! Sometimes in our lives, we may nearly lose all hope. We may even feel like we can't go on and there is no use in trying. It is at those times that we must not lose our hope. We must continue to believe there is a happy ending. Cinderella almost gave up. If she had, it would have cost her a prince and a happiest of endings. Her prince came to her rescue and so will our Prince. 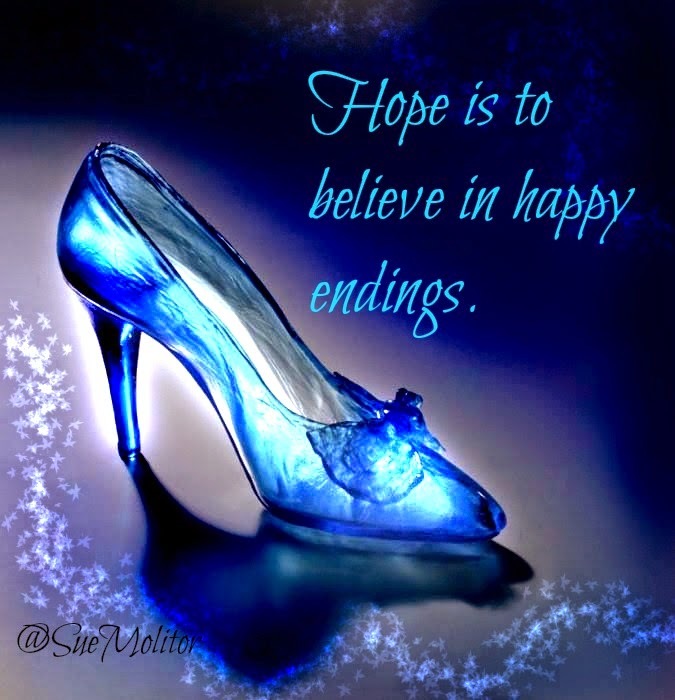 I love this picture of hope as believing in happy endings mostly because it is so simple and child-like. The Lord says in His Word that we are to have faith as a child and come to Him as a child (Mark 10:15). Believing is child-like faith. I understand that life can be hard and your circumstances may look dismal. In fact, perhaps you are at that place where you have almost lost all hope...hopelessness. If that is you today, my hope and desire is to encourage you to have hope. My aim is to encourage you that God has a good plan for you. We play a part in writing our own stories. Yes, we make choices daily. We decide in what direction the plot will turn. However, as long as our pens are in sync with the Author, we can rest assured He is guiding our story towards a happy ending. This is the great mystery. How do we write our own stories when there ultimately is a divine Author. I may not be able to answer that question, but I do know the Author and I know He is good. Sometimes our happy endings look different than how we would have written them, but He is a better writer than us We need to trust the Author. Lord, I trust you. I pray my pen is hand in hand with Yours. I thank you that I can be confident for the things I hope for because I can be confident in You. Thank you Lord for happy endings. I believe. Amen. "Now his older son was in the field. And as he came and drew near to the house, he heard music and dancing...But he was angry and would not go in. Therefore his father came out and pleaded with him." Luke 15:25, 28. Great story. The first son had squandered away all his inheritance, he turned his back on his father and family and decided to live only for himself. The second son stayed at home, was in sense "a good boy" and worked hard on the farm. Who sinned? Did the first son sin who wasted all he had on foolish living? Did the second son sin who worked hard for his father? Yes. And Yes. Both sons sinned. In Romans 3:10, it says, "There is no one righteous, no not one." Who is the Father for in this passage? Who does the Father care more about? The Father is not for one of His sons and against another. He is for both. He desires both. The body of Christ is not in competition with each other. The second son in the passage made the mistake of thinking that if his father was for his first son, then he was somehow being robbed. And what I found so incredibly beautiful is how the father ran to both sons. It says in the passage the father ran to his son even when he was still a great way off. The Father will run to His sons and daughters even when they are still a great way off. Grace runs towards. And when the second son was also in sin and angry (and most likely self-righteous, prideful and jealous), the father didn't abandon him either. "His father came out [to him] and pleaded with him." Grace moved toward this son as well. What I want to point out in these verses is how in both cases the father moved towards his sons even when they were struggling with sin. As Christians, I think we are sometimes afraid of those we see who are struggling with sin. Maybe we are afraid we will "catch" the sin like a disease. Or maybe we don't want to associate ourselves with those in sin in fear of what people like think of us. Or maybe we are just full of self-righteousness and pride like the second son and think we are better than our brother. Ouch. The Bible does clearly warn us to be careful when attempting to restore a brother who has been in sin so we don't fall into temptation (Galations 6:1), however, it is only saying that to remind you that you too are prone to sin and no better than your brother. If we can truly look at others with the eyes of grace, realizing that we are not better than others, I think we would be able to run towards our brothers with grace with open arms and loving hearts. 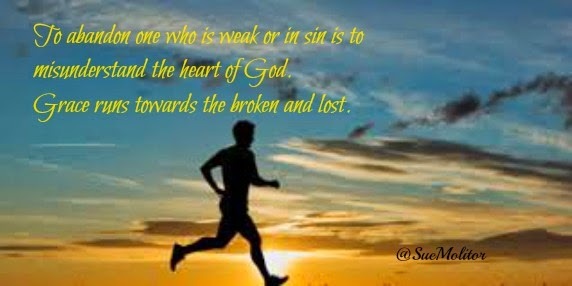 To abandon one when they are weak or in sin is to misunderstand the heart of God. Grace runs towards the broken and lost. I am speaking to myself as well here. I need this. All I know is that when I was in the depth of sin, there was no one running toward me. All I felt were people pushing me away. How beautiful it would have been to have felt the loving breeze of grace running towards me in my greatest time of need. I pray I would remember and be that breeze of grace for others. Today, I want to encourage you to run towards someone. Be that breeze of grace. It may be just the breeze they need to lead them back to the Father. Last summer my family and I went to Typhoon Lagoon, a water park at the Walt Disney World Resort in Florida. At this park, there is an attraction where you can literally swim with sharks. However, these sharks are "friendly", meaning they stay at the bottom on the diving tank and don't eat people. I wouldn't want to swim with any other kind of sharks, only Disney sharks. The other day, the Lord revealed to me that I have been swimming with sharks spiritually. In contrast, these sharks are not like the ones at Disney. They are not friendly, and to continue to swim with them will only lead to captivity and eventually death. Swimming with the sharks is representative of living with a hidden sin. In my case, this sin was unforgiveness. I honestly didn't recognize the sin nor the danger until the Lord revealed to me I was swimming with sharks. Sin is sneaky and often disguises itself as "friendly". Sin will swim next to us pretending to be on our side, all the while leading us into a watery trap. The serpent pretended to be Eve's friend. Serpents and sharks are never our friends. He appeared to be wise and on her side, all the while luring her to her death. The enemy isn't interested in just getting us to taste sin. He wants to destroy. If you have been swimming with a shark, big or small, I want you to join me in getting up out of the water. Perhaps you are comfortable with your shark and he feels safe. He isn't. He is a shark! Read the verses below and see how serious it is to swim with sin. These verses are sobering. Thankfully, we have an advocate, Jesus Christ, who helps us get up out of the shark infested waters. The Lord wants to help you out of the water. He is walking out to you. He is not afraid of your shark or your sin. Take his hand and let him help you out of the water. Ask Him for forgiveness. Don't be led into the destructive trap set. Get out of shark infested waters! Serpents and sharks are never our friends. Father, I realize today that I have been swimming with sin. Father, please forgive me for _________ and help me out of the water. I don't want to continue in this sin. I want to be free. Help me Lord. In Jesus' Name, Amen. My friend and blogging cohort Becky Crenshaw introduced a new way to read through the book of Psalms in the month of March. Click here to read more about it. I am one of many following her lead in reading through Psalms. Yesterday, one of the verses I read was the above verse, Psalm 62:5. 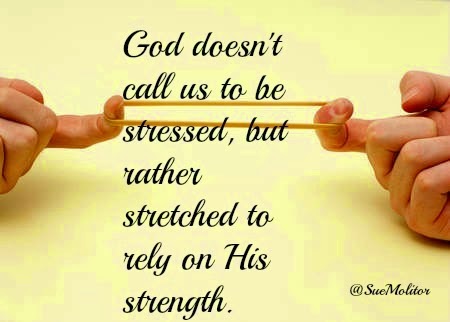 God doesn't call us to be stressed but rather stretched to rely on His strength. There is tension placed on a rubber band when stretched. The strength of what is holding the band keeps it from moving. The little rubber band is unaware of what is happening at first. It may hurt. It may feel uncomfortable. However, as it is being stretched, it grows. It changes. It expands. It takes on a new shape as it is drawn in close to its holder. The band takes on a new shape for a useful purpose. This new shape can only be cultivated by the strength of its holder. A rubber band left in a drawer may be comfortable, but it isn't fulfilling a purpose. I'm sure you can tell where I am going with this. God is our Holder. He is our strength. When we feel stressed, we are actually being stretched for a purpose. It feels uncomfortable, but we can be certain He is holding us. And as long as we trust in the Holder, we won't be moved.